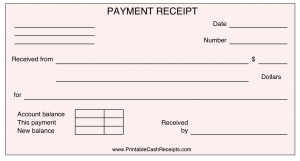 If you’re a freelancer, small business owner, or deal in retail or online sales and donations, you’re sure to find a helpful printable among the two dozen printable cash receipts I’ve just added to my website PrintableCashReceipts.com. There are now nearly 300 receipt templates at PrintableCashReceipts.com, and these selection of printable receipts ranges from simple to complex. There are blank and labeled sales slip templates for all kinds of businesses. PrintableCashReceipts.com also has rent receipts, petty cash receipts, deposit receipts, and donation receipts for nonprofits. The receipts come in various sizes, with one, two, three, or four per sheet. The new business receipts include illustrated receipts for: home repairs, library checkout, maintenance, membership, and partial payment. Other receipts cover restaurant reservations, hotel rooms, and rideshares. Other new templates at PrintableCashReceipts.com include: colored payment receipts (blue, green, purple, pink and yellow), a car payment schedule, mortgage payment schedule, shipping manifests, and a general ledger. Download and print any receipt free in PDF form and then write on it in pen or pencil. If you’d like to customize a receipt by typing into it before printing, or add a company logo, a premium DOC version that can be edited with Microsoft Word is $7 per design.